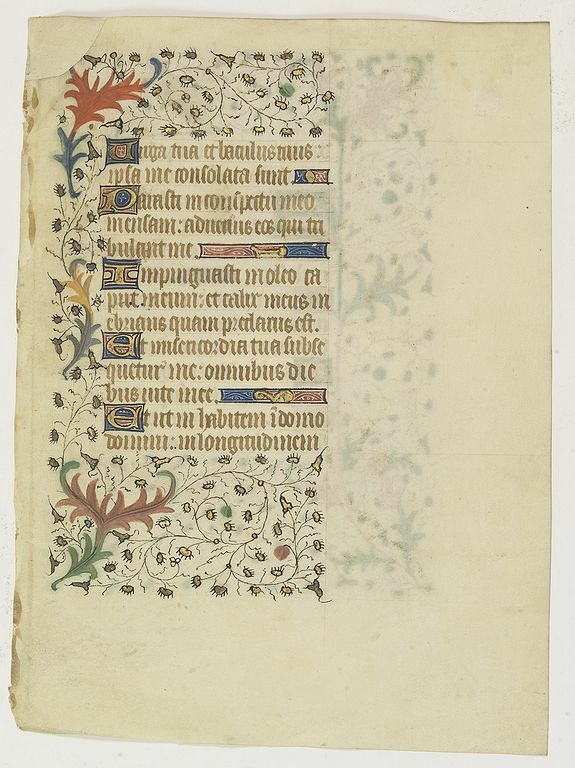 BOOK OF HOURS - A manuscript leaf from a Book of Hours. Date : Paris, ca. 1445. Size : 8.5 x 6.3 inches. / 21.7 x 16.0 cm. Description :Justification : 16x10cm. RECTO: Five 1-line initials in burnished gold on coloured red and blue grounds and 3 line fillers in same. VERSO: One 2-line initial A and three 1-line initials in burnished gold on coloured red and blue grounds and 1line filler in same. Each side three-sided illuminated panel borders of fine gold leaves and coloured flowers sprouting from a stem with acanthus leaves, in very refined colours. Condition : 13 lines of text in Latin, written in dark brown ink in a nice Gothic book hand. One corner with reinforced vellum.